Don't let the Pitbull name foul you. Buddy is 100% teddy bear. He truly believes his purpose in life is to love and snuggle. Yes buddy had a rough upbringing living on a porch in a crate 24/7 but he is making up for it now. Those days are long forgotten. He is looking for his furever home. He is willing to share with two and four legged babies! He is a ball of energy and is fully housebroken and is doing well with knowing that he isn't allowed on furniture. At night he sleeps with his foster brother and sister on one of three beds but also knows how to be crated. During the day when his foster mom and dad are at work he chills in the backyard chasing his tail and birds. Will you be Buddy's forever home? He told me that all he wants for Christmas is his new furever home and he even has his own personalized Stocking ready to be hung! Buddy has settled nicely in his foster home he shares with two Boxers. Check out our "BUDDY" who was placed into an awesome home with kids but the dad who does not live with the family was just another victim of the wrong reputation pitties have. He demanded Buddy to be returned to the rescue or else. 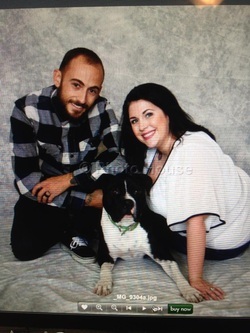 On Christy's recent photo shoot, BUDDY became not only the star model but showed how gently and loving Pitbulls really are. We are hoping somebody will see BUDDY's amazing personality and send in an application.